Provide the highest quality of compassionate, state-of-the-art neurological care to the people of Nebraska and surrounding states. Build upon our strengths and programs in nationally recognized multidisciplinary centers of excellence for disease-based care. Conduct innovative clinical, translational, and basic science research to advance knowledge and treatments for neurological disease. Provide premier educational programs to train the next generation of neurologists to serve Nebraska, the region, and the nation. Promote education and outreach in neurological advances to the wider community of medical professionals, patients, and the public. 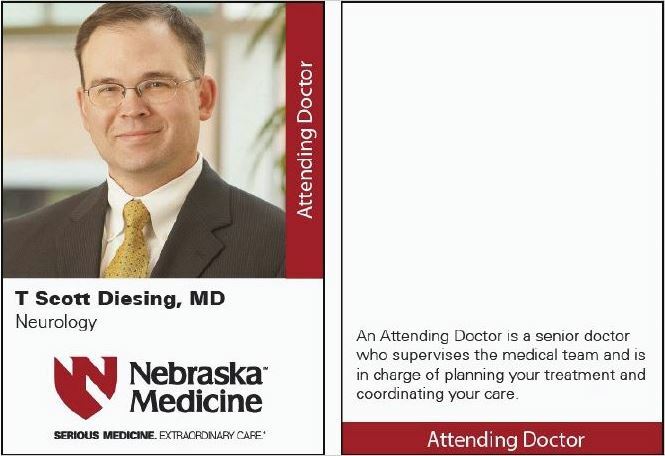 Dr. Scott Diesing has been instrumental in creating new provider cards for physicians and other care providers at UNMC and Nebraska Medicine. These help patients put names and faces together, and they're especially useful for hospitalized patients who may be seen by providers and consultants from many disciplines. The Department of Neurological Sciences is proud to be a part of this important new patient satisfaction initiative.